This four night cruise begins at Devizes, a vibrant market town rich in history and listed buildings and well worth a visit before joining the boat for your cruise. Devizes is home to the Wiltshire Museum, the Wadworth Brewery which still uses Shire horses to make local deliveries, and the Kennet and Avon Canal Trust Museum occupying a restored canal side warehouse on the Wharf. As our cruise departs Devizes, the navigation descends the impressive Caen Hill flight of 29 locks with its spectacular views over the Avon Valley, and said to be one of the 7 wonders of the waterways. The 29 locks lower the canal 237 feet in 2 miles and can take a total of 5-6 hours to traverse although we don’t complete the whole flight in one go! You are welcome to help with the locks if you wish but if you prefer, just sit back and watch as we work the boat through the flight! 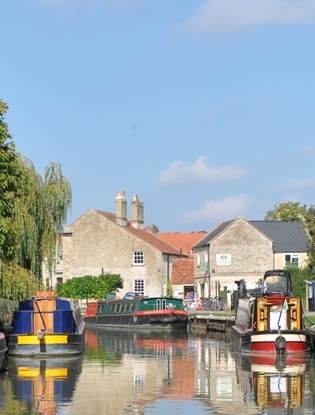 The final lock brings us out at the delightfully named Foxhanger Wharf, and our cruise continues West to the charming village of Seend Cleeve, once home to the ‘Wiltshire Giant’ Fred Kempster. Here we pass through another much smaller flight of five locks and follow the canal to two further locks at Semington where the now derelict Wilts & Berks canal originally joined the Kennet and Avon.